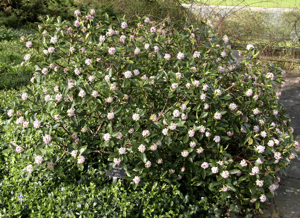 Many shrubs adapt very well to growing against walls and fences and, once trained in, are usually easier to manage than climbers which can quickly outgrow their allotted space. Here are five evergreens that lend themselves very well to being wall-trained and between them provide seasonal interest throughout the year. Ceanothus (or ‘Californian lilac’) make excellent candidates for growing against a sunny fence or wall as they benefit from the protection provided against cold, drying winds. 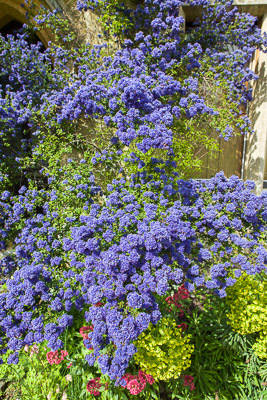 One of the most strikingly beautiful is Ceanothus ‘Concha’ which produces a dazzling display or intensely dark blue flowers for several weeks in May and June, perfectly offset by the small, glossy dark green leaves. The bushy growth provides excellent screening for fences and walls and a perfect backdrop for a sunny border. 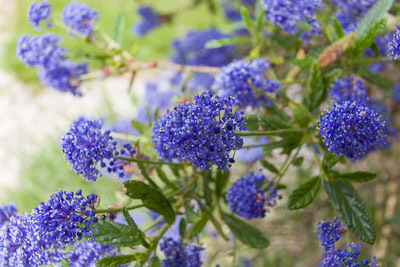 Ceanothus perform best on fertile, well-drained soil and benefit from a good mulch of organic matter after pruning. To keep in shape, trim side shoots back by one third after flowering. Some shrubs are definitely shown off to best advantage when wall trained and Garrya eliptica ‘James Roof’ is one of these. 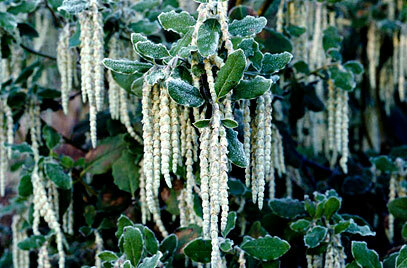 Throughout the year, its glossy, wavy edged, dark green leaves make an elegant foil to other flowering shrubs when it is planted at the back of a border, but make sure it is planted where it can be fully appreciated in winter when the long, silken tassels of silvery flowers that cover it from December to February make it a really eye-catching architectural feature. 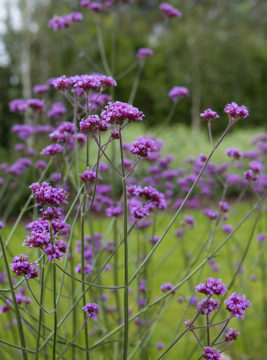 It can grow to 4m x 4m and looks best when given generous room to spread. 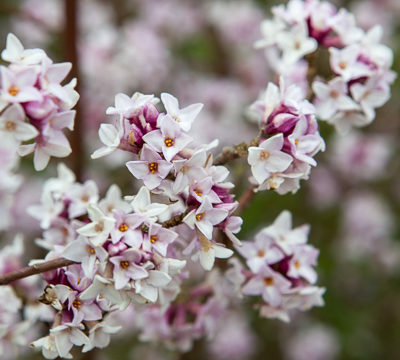 Happy in sun or shade and on any reasonably fertile soil as long as it is well-drained, it simply requires pruning after flowering to remove any dead or straggly growth. Top tip: plant deciduous clematis nearby and allow to scramble through the Garrya branches to provide summer colour. 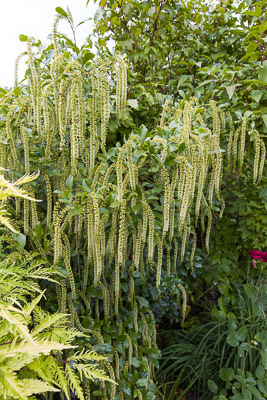 Itea ilicifolia is also a tassel bearer, but its striking greenish white, vanilla scented catkins appear in mid-summer to early autumn. It will tolerate shade quite well, but prefers a south or west facing aspect where its shiny, holly-like foliage looks lovely throughout the year with new growth in spring beginning in beautiful shades of red. Young plants in particular benefit from the protection of a warm fence or wall as they may be hard hit by cold, drying winds and require protection from frost in exposed areas. 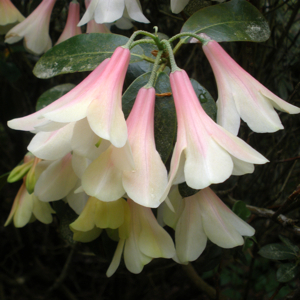 Plant in any fertile, well-drained soil and mulch around young plants in autumn. Grows to 4m x 3m in height and spread, but can be pruned to size. 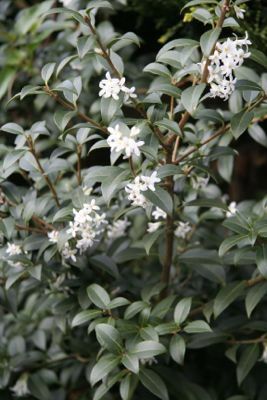 Osmanthus burkwoodii performs happily when grown against a wall or fence in sun or shade where its glossy, dark green leaves make a neat backdrop, but it is particularly useful for bringing light and interest to shady spots in April and May, when the highly scented, white, jasmine like flowers appear. 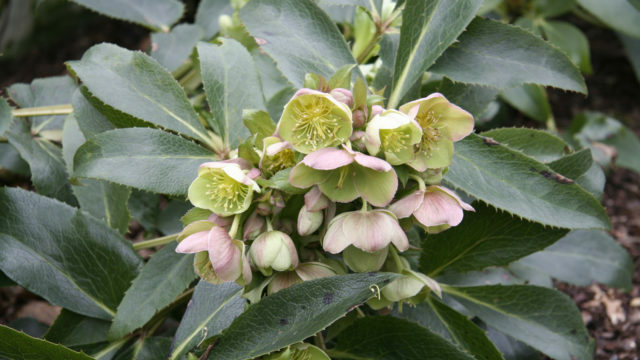 It will cover an area of roughly 3m x 3m and is a very easy going plant being fully hardy, not fussy about soil type and requiring only light pruning with shears after flowering to maintain its shape. Gardeners have had a long and very literally painful love/hate relationship with Pyracanthas, but when properly trained and pruned they make a wonderful architectural feature against a house or garden wall. 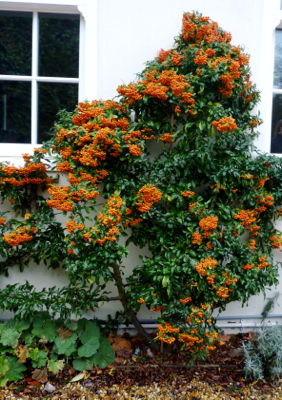 Pyracantha ‘Orange Glow’ has dense clusters of tiny white flowers in May which are followed by bright orange berries in autumn/winter that are a favourite of blackbirds and thrushes. 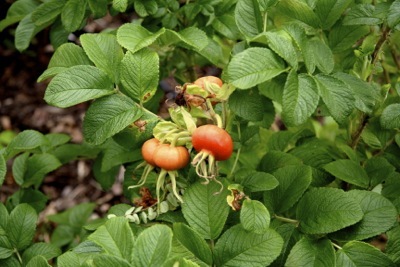 It is very versatile, being fully hardy and happy on any reasonable soil and in any aspect apart from very dense shade (but the more sun, the more berries). Height and spread: 2.5m x 2.5m. Top tip: Prune in late summer shortening all side shoots that arise from the main framework and stopping just short of the clusters of berries (usually about two to three leaves from the base of the side shoot). Wear thick gloves! Top tip for all wall trained shrubs: the area next to a wall is usually very dry so plant shrubs at least 40cm from the base of the wall and make sure to prepare the soil well before planting. Remove any rubble, incorporate plenty of well-rotted organic matter and water well to establish.